Garlic. Most of us love it, but we really don't know how to properly store or preserve it. I've got some easy methods that will keep you using and loving your garlic all year long. Garlic is a great fall garden crop, and whether you are growing your own, or finding an abundance of freshly harvested garlic at your local farmers market, this is the time to stock up on it while it's fresh and in plentiful supply (making it a bit less expensive than at other times of the year at the stores). 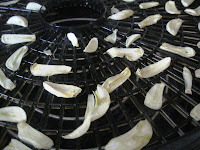 With a few easy steps I'll show you how to store your garlic. 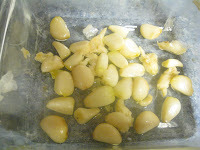 There are 3 main methods for storing Garlic for long term & short term storage. This is my favorite method for long term storage. It's quick & easy to do. Especially when you find a good price at the store or farmers market, pick up a few extra bulbs and you can get them in the freezer pretty fast. 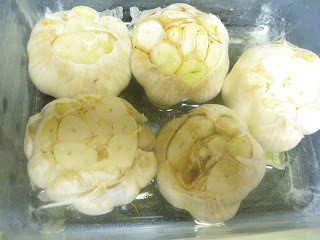 There are several ways to freeze garlic. 1) You can freeze the whole bulb and then grate off what you need when you need it. I don't like this method, personally. 2) You can chop, slice or puree the garlic and then freeze little amounts of it in individual plastic wrap baggies and just pull a baggie out when you need it. (I'd wrap them into little plastic wrap squares,t hen store all the "baggies" together in a quart sized bag. 3) My preferred method is to freeze the individual peeled cloves. I lay them on a cookie sheet and flash freeze them, till they are frozen individually. (This keeps them from sticking together). Store the flash frozen cloves together in a freezer bag/container. Just pull out as many cloves as you need, and smash, dice, etc. from there. I have a bulb of garlic dehyrdrating as we speak! Simply slice your peeled garlic into 1/4" or 1/8 " slices. Lay on your dehydrator racks and dry until the slices are hard and crisp (even on the inside) and they are still light in color. (Anywhere from 12 hours to two days depending on temperature, thickness of slices, etc.) (If you dry them too long and they turn brown, they get some bitterness). 1) You can store the slices in a mason jar. I use this method. I just crush the slices in my hand before tossing them into my cooking. 2) you can run the dried slices through a grinder or rocket blender and crumble them into chunks or even powder and store them in a mason jar also. Jan's IMPORTANT Safety Tip: Caution: This method is NOT safe to store un-refrigerated! Low acid foods, like garlic are a source of botulinum bacteria, and stored in a non-oxygen environment such as oil, provides a great breeding ground! 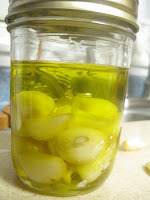 Commercial jars of garlic in oil have an added acid to it that prevents the bacteria growth. Homemade products have no way of really measuring a proper amount of acid, and therefore this method is ONLY safe if stored in the refrigerator and used with in 3 weeks! BUT if you store it in the fridge and use all the garlic with in three weeks you should be safe. http://www.gourmetgarlicgardens.com It's safe in the refrigerator, but with my crazy life, I hate the pressure of trying to use it up and monitoring the expiration date, when there are other great methods to store it!